1843; Eruption is preceded by an earthquake. The spewed material is ash, sand, and sandstone. Furthermore, in 1908, 1915, and 1917 in various places in the bottom of the crater and the embankment looks copy fumarola. 1963; Eruption began on 18 February 1963 and ended on 27 January 1964. Eruption is magnetic. The death toll was 1,148 dead and 296 wounded. 2017; In September 2017, an increase in rumble and seismic activity around the volcano heightened the normal status of alert and about 122,500 people were evacuated from their homes around the volcano. The patterns and distribution of eruptions before 1808, 1821, 1843, and 1963 show similar types of eruptions, such as explosive (eruptions, throwing sparks, lava fragments, pyroclastic rain and ash), and effusive streams of hot clouds , and lava flows. The lava that grew between 19 February and 17 March 1963 flowed from the main crater at the top to the north, through the edge of the lowest crater, stopping at the line height of 505.64 m and reaching distance ± 7,290 m.
In Gunungapi Agung there are two kinds of hot clouds, namely hot clouds of eruption and hot clouds falling. Hot cloud eruptions occur at a time when there is a large eruption. The speed of this eruption cloud according to the observations of Pos Rendang is an average of 60 km per hour and to the south reaches the farthest distance of 13 km, ie in the Northeast and north of 14 km in the East. The area affected by hot eruption clouds in 1963 activities is limited to the southern and northern slopes only, because both in the west and east of the crater there is a back. Both of these backs extend from west to east. Hot clouds of eruptions that extend beyond the eastern crater rim are broken down by the backs into two majors are the northeast and southeast. Thus the hot clouds in the west are broken down by the western back to the southwest and north directions. The hot clouds of eruption that occurred during the 1963 activity have struck an area of ​​± 70 km2 and caused the fall of 863 human casualties. The Ulakan Formation (Uvs) consists of limestone coral, lava and volcanic breccia. This rock is thought to be Andesite basaltis. Kondangdia rock group (Kv) This rock group is found in the eastern part of the old activity consisting of old lava flows with sheeting joint structure, slightly weathered. Budakeling Stone Group (Bv) is located in the southeastern part of the Great Volcano in the area of ​​Budakeling consists of lava and volcanic breccias with fragments of frozen rocks are diverse. Group of Cuncture Rock (Cv) is in the south, lava and pyroclastic rocks. The Tabis Group (Tv) is situated west of the Great Volcano, formed by lava and pyroclastic. Batur Volcanic Rock Group (BAv) is located in the western part of Gunungapi Agung and is the result of eruption of old Batur volcano. 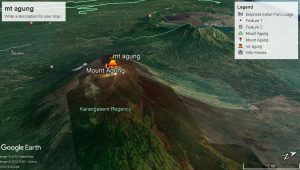 The geological structure of Gunung Agung Complex – Abang – Batur – Budakeling shows a northwest-southeast direction. Tukad Daya River – Tukad lateng shows an alignment that cuts off some of the Tabis hills found in the center. In the south – southeast of Great Volcano shows the transversal of the ridge which is expected to form a shear fracture.